If you love nature, if you love the changing of the seasons, if you love bringing your kids into the woods or prairie or ocean…. If taking a deep breath of fresh air makes you feel connected to yourself and looser, softer and stronger. Like you are a part of something comforting, powerful, easier and bigger than you can imagine….then this book is for you. A girl sits in her favorite perch up in a tree and observes the natural world. She documents in her notebook what she sees and hears- about the chipmunks, the fox, the rabbits, the geese. She watches, she sees, she hears, she draws. The simplicity of being a part of the world and not trying to make something happen is profoundly relaxing. This book is all about it. It’s calming to read. 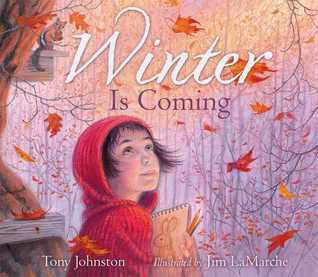 This entry was posted in children's books and tagged winter is coming, woodland creatures on April 8, 2013 by skylikeme.